When it comes to tailoring, trust Marina Rinaldi to perfectly navigate between classic and contemporary. This stunning blazer shows the upmost reverence for the rules of dressing for business but the eyelet fasten feature gives it a modern twist. in addition, the back of jacket is beautifully cut to define your shape. 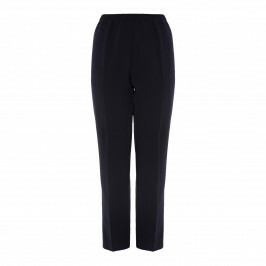 Team with Marina Rinaldi triacetate trousers in navy and a simple white shirt or top. Semi-fitted blazer in comfortable, compact triacetate with lapels, long sleeves, welt pockets on the front and seams on the back to define the silhouette. Lined. 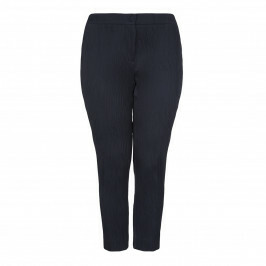 Fastened with metal eyelets and coated-effect ties. Woven fabric: 71% triacetate, 29% polyester; Lining: 57% viscose, 43% polyester. Do not wash with water. Do not bleach. Cool iron max 110 °C. Delicately dry clean using perchloroehylene. Do not tumble dry. Do not professional wet clean.